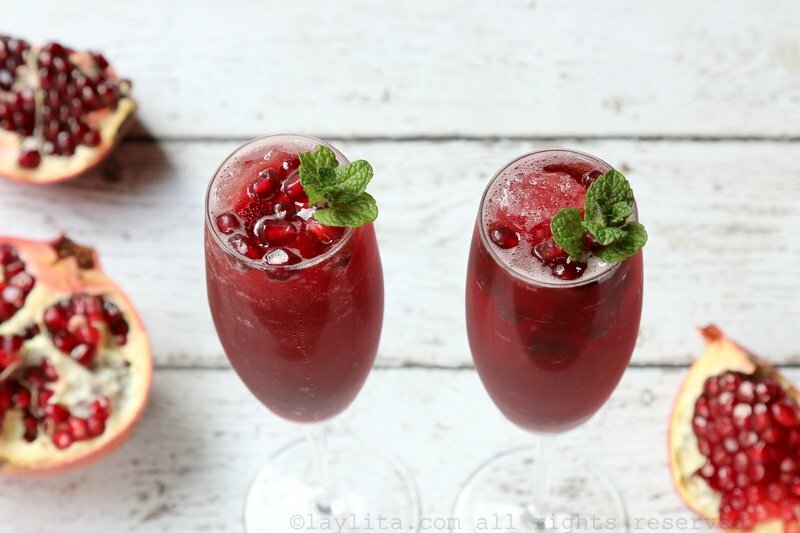 This sparkling pomegranate cocktail is made with pomegranate tequila sorbet and champagne or sparkling wine. 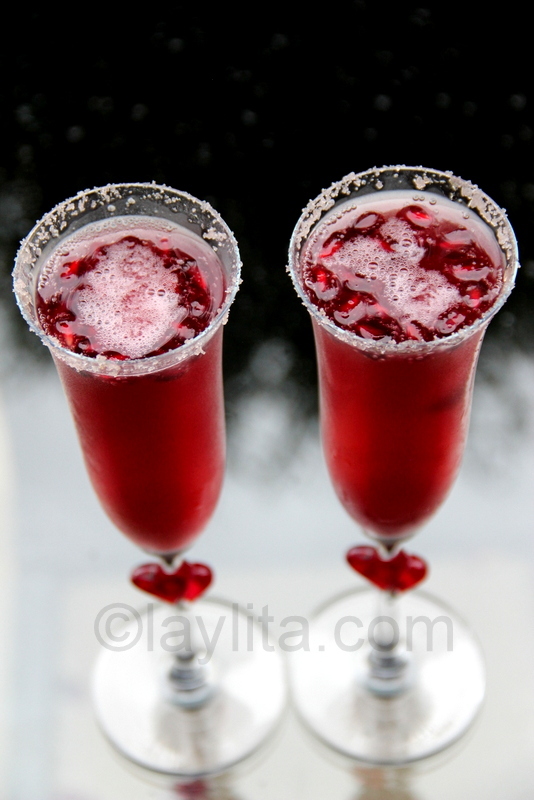 I was trying to think of the best name for this drink, should I call it sparkling pomegranate frozen margarita or a pomegranate tequila mimosa – it’s almost like a marriage of those two drinks. Regardless of the name, it turned out to be a refreshing cocktail that is both delicious and sparkly. 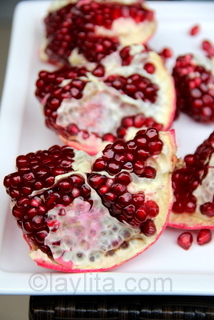 Pomegranates are great in desserts and cocktails, but they also work really well in savory dishes, from salads to salsas to meat dishes. 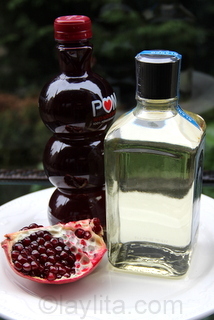 Some of these dishes require pomegranate juice, which can be a lot of work to turn them into juice. 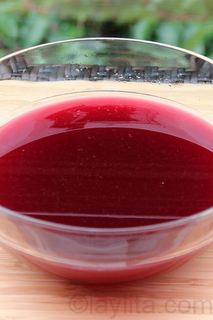 Fortunately, these days you can find good quality pomegranate juice in most grocery stores. 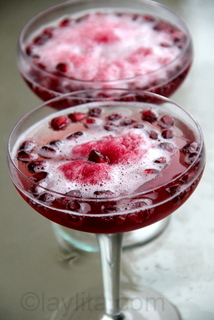 Sparkling pomegranate cocktail made with pomegranate sorbet or granita, tequila, and champagne or sparkling wine. To make the simple syrup, combine the water and the sugar in a small saucepan. Bring to a boil, lower the heat and stir well until the sugar is completely dissolved. 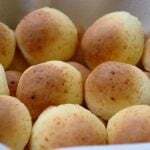 Remove from the heat and use as needed. 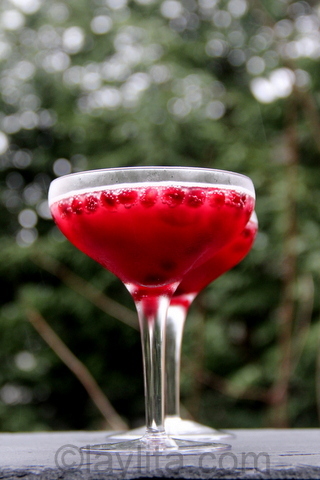 Mix the pomegranate juice, simple syrup, lime juice and tequila together. Pour the mix into your ice cream/sorbet maker and prepare it according to your device’s instructions. 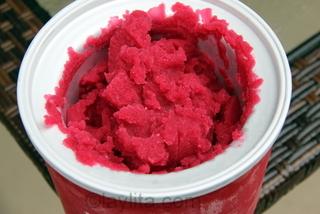 Place the sorbet in a container and freeze until ready to use. 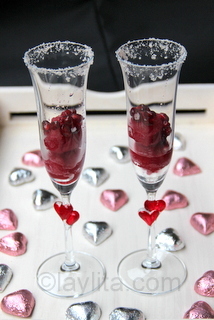 Place a scoopful of sorbet or granita into a champagne glass or any cocktail glass. 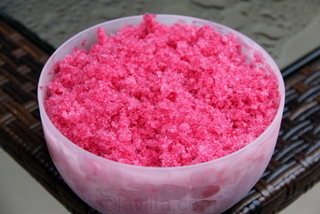 Decorate the rim with sugar if desired. 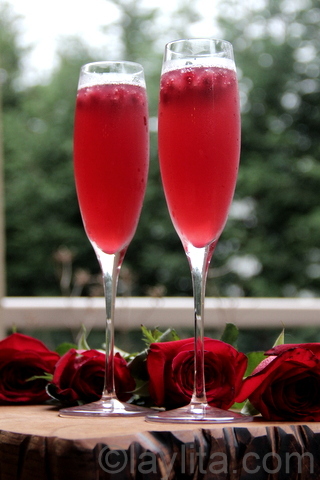 Top with chilled champagne or sparkling wine, do this in small increments to keep the drink from overflowing. 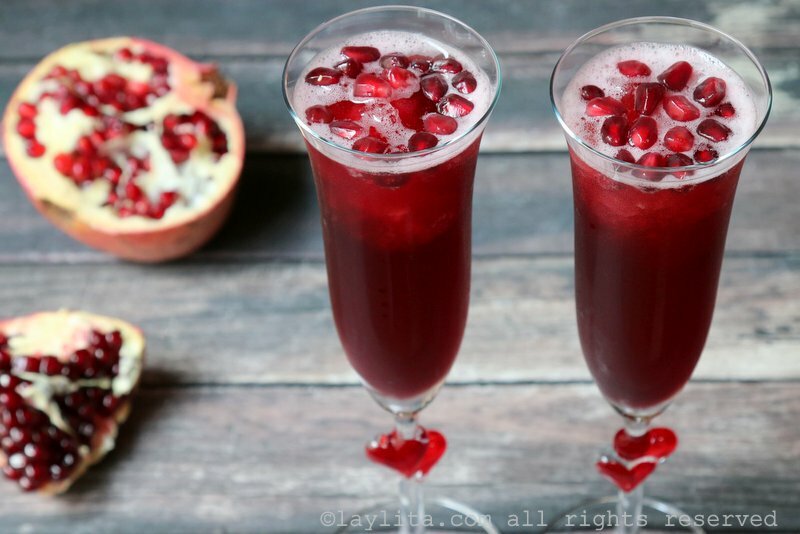 Garnish with the fresh pomegranate arils and serve immediately. 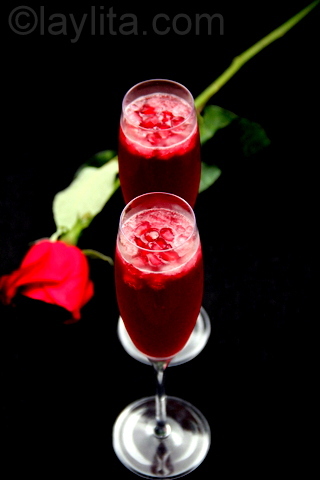 For a mocktail variation of this drink, leave out the tequila from the sorbet and use chilled sparkling lemonade instead of the champagne. 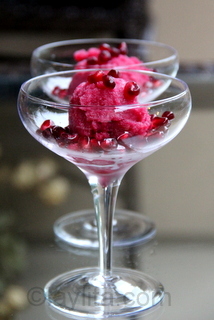 For this recipe I started by preparing a pomegranate tequila sorbet, you can also make a granita if you don’t have an ice cream maker, which on its own can be a refreshing adult dessert. 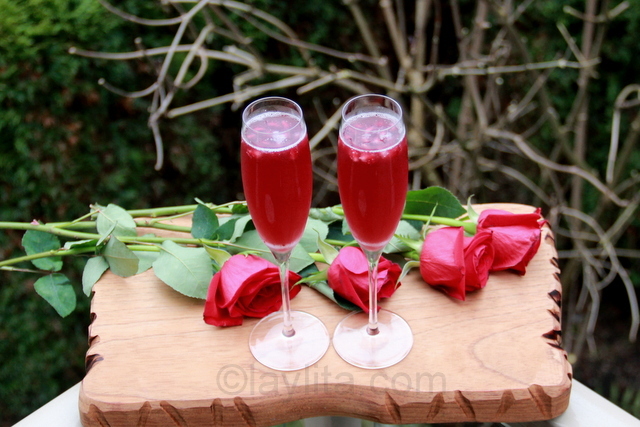 The pomegranate juice is already sweet on its own; however I did add some homemade simple syrup since it will be mixed with the champagne. Simple syrup is a mix of sugar and water, you can buy it or just make your own, and it’s basically a way to make sure that the sugar mixes more smoothly into a sorbet or cocktail. You can adjust the amount added according to your preference. 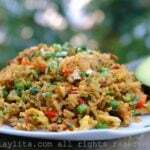 You can put a small amount of tequila just to give it a hint of flavor or you can make it stronger. The tequila, even a small amount, also helps keep the sorbet very smooth. Of course, with too much tequila it won’t freeze, but will just remain more of slushy. 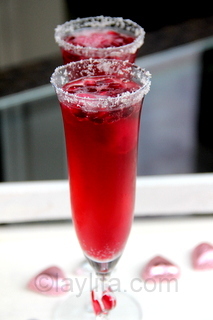 To turn it into a cocktail, just put a scoopful of the sorbet or granita in a glass, and then pour chilled champagne or sparkling wine over it. 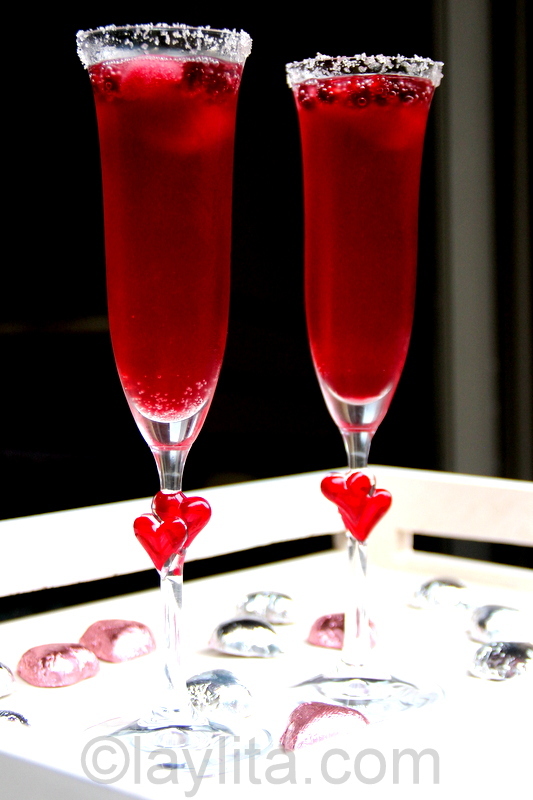 You can use your preferred type of sparkling wine: champagne, cava, prosecco, etc. 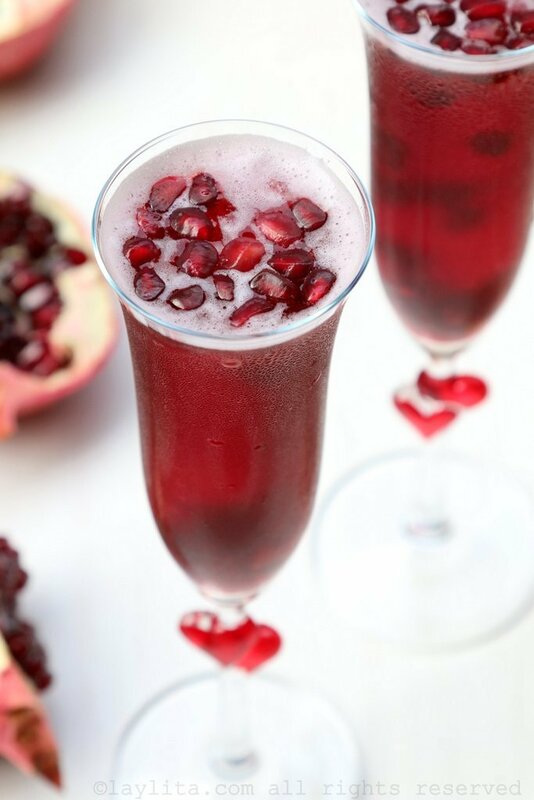 If you have a fresh pomegranate you can use the arils to garnish the cocktail, they sparkle in this drink. You can make the sorbet or granita at least a day ahead of time, this way it will just be a question of assembling the drink when it’s time to serve.